If you are like most people, then you own a lot of jewelry. And, also if you are like most people, you probably struggle with what to do with it all and how to store it. Don’t worry, though. There are plenty of ways to care for and to carefully store your jewelry, including many ways to make a DIY jewelry organizer. And, if you carefully follow our helpful tips, then, you should have no problem creating or improvising a great DIY jewelry organizer that will help to keep your jewelry pristine. For starters, we have to say that there is probably no simpler or better way to store your jewelry, especially your less expensive costume jewelry, than to hang it from the walls in your home. Jewelry looks particularly great in bathrooms or other rooms that don’t get a lot of attention from outsiders. However, if you are worried that hanging your jewelry might look “tacky,” you could always hang it in a laundry room, large closet, or other room that you are the only one who visits. And, while there are a variety of ways to hang your jewelry, including from simple hooks and nails, we really like the idea of hanging long wooden or metal sticks, painted in a color in you like, and then putting your jewelry on those. 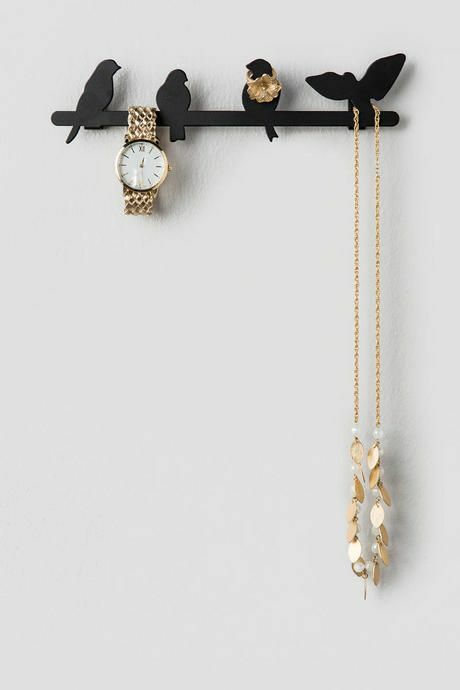 This is an easy way to make your jewelry easily accessible, and, if you’re particularly stylish and crafty about how you hang it, it can actually look nice too. If you don’t like the idea of having your jewelry hanging directly from the walls, then a corkboard might be a great option for you. You should easily be able to find an appropriately sized corkboard or at least one that you can cut to size by going to a craft or hobby store. These boards are designed to have pushpins stuck in them, so also find some of those that you like and that complement the corkboard that you have chosen. Then, from there, arrange your jewelry as you see fit. 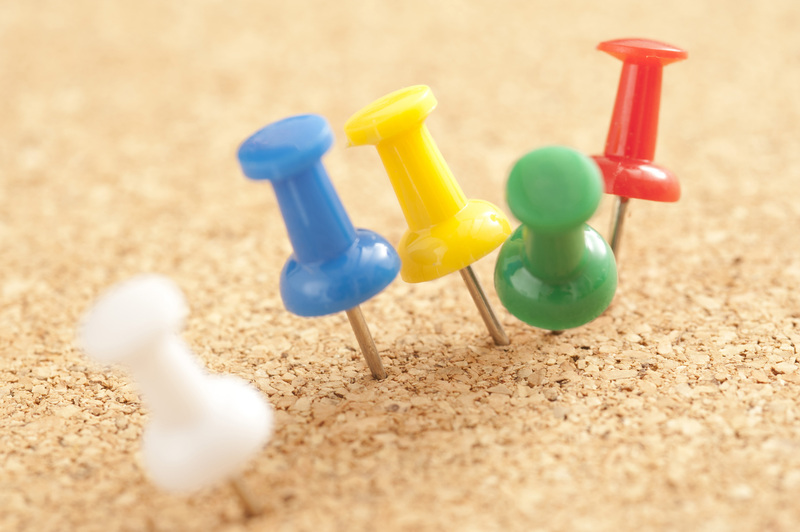 Keep in mind too that, if you’re feeling particularly creative, you can always add stamps or stickers to your corkboard or even paint it in a color or design that you like to give it that extra flair. Of course, there is also something to be said for the rustic look of unaltered corkboard, so choose your look and style as you see fit. Perhaps one of our favorite super-cute ideas for storing jewelry is to invest in some small, colorful teacups. Or, if you’re lucky and already have some on hand that you’re not using, you can use those. In either case, arrange the teacups artfully, such as in a pulled-out drawer or atop a flat space, and put your jewelry inside. This will make for an intriguing little display that is also super practical and fun to boot. If you don’t like the idea of teacups, don’t worry. There are many other cute ways in which you can store your favorite jewelry. One other option, for example, is to go for cute little baskets. You can get all the same baskets, or you can go for different looks, styles, and sizes if you want something that is a little more eye-catching. No matter what you ultimately go for, cute baskets stacked with your jewelry are a great storage option. You can even tie them with ribbon for that extra polished look. For something a little more rustic and functional, then consider lining your closet door, bedroom door, bathroom door, or any other door in your home with nice little rows of coathooks. 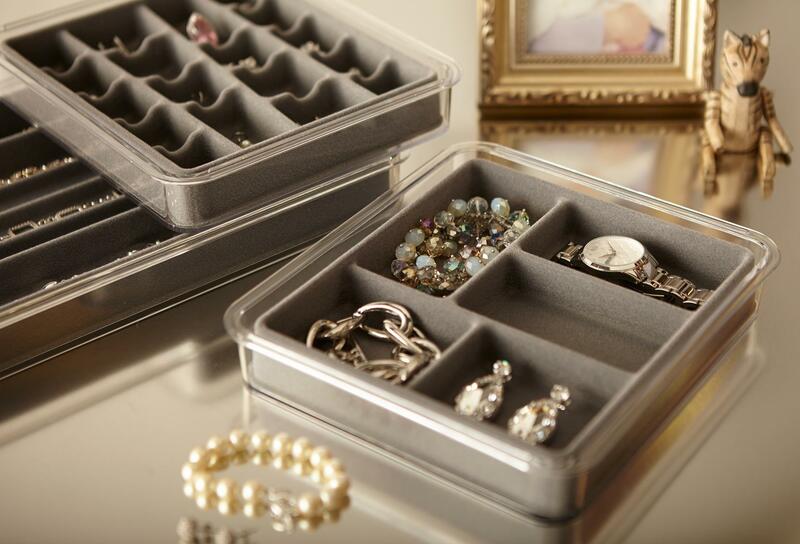 You can go with as few or as many as you need to store all of your jewelry. Keep in mind that coathooks are available in many different sizes, so you can easily find hooks to accommodate all of your different types of jewelry from rings to long necklaces. Are you short on space? Don’t worry. We’ve all been there. Chances are, though, that even if you don’t have a lot of space, you probably have a shelf or two hanging in your home. If that’s the case, you can easily maximize that shelf and its efficiency by drilling small holes into the bottom of it, attaching hooks, and then hanging your jewelry. 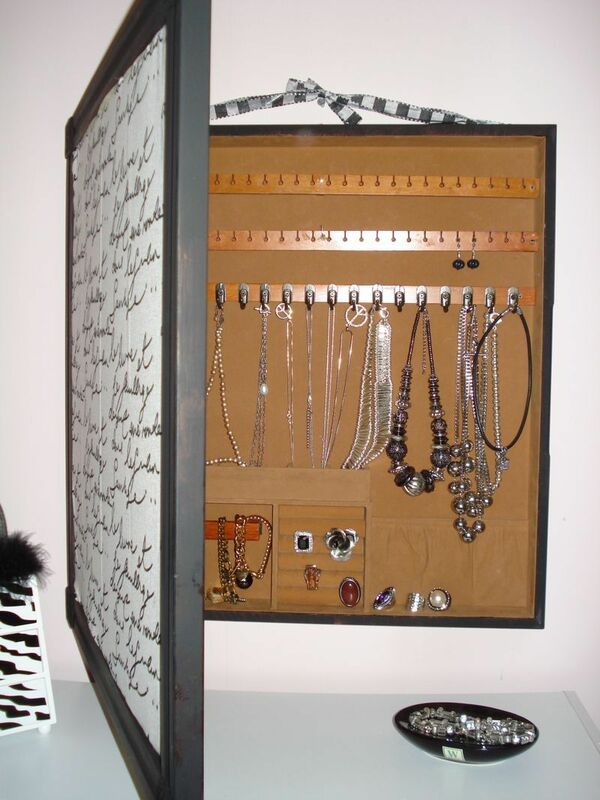 This is a great and simple way to store your jewelry without attracting a lot of attention. In fact, in most cases, it will simply blend seamlessly into the rest of your home. Sometimes, things that aren’t meant to be jewelry holders actually serve perfectly as DIY jewelry organizers. Take that Eiffel Tower stand you found at Target, for example, and drape your jewelry over it. 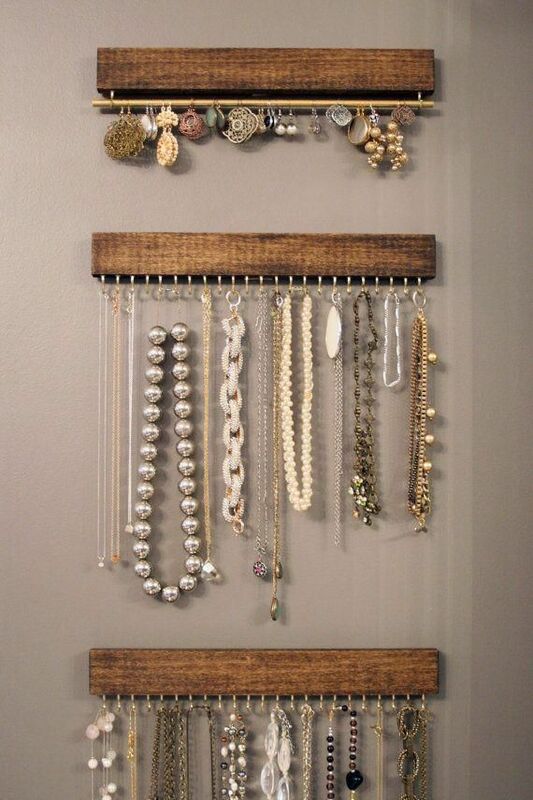 Or, go for a scarf holder and transform it into a fabulous necklace display. Even fun and funky art pieces, like a tree, can serve as the perfect place to “branch” out your jewelry. When it comes to storing your jewelry, the sky is the limit, so get creative. Look around local stores, boutiques, and even thrift shops and yard sales to find a fun item that you can turn into a DIY jewelry organizer with minimal effort or, in some cases, with no effort at all. If you are not the kind of person who likes your jewelry to be out in the open, or, if you have expensive jewelry that you want to keep hidden, don’t worry. Plus, you can add a lock to your jewelry drawer for even more security. That way, you can ensure that you are the only one enjoying your stylish jewelry display and, even more importantly, your jewelry itself. Another great idea for those who don’t want their jewelry out in the open is to get a safe, the kind designed specifically to protect jewelry or other goods. Make sure that you choose a combination carefully, something that is not easy to guess. And, from there, have fun with it. This is an awesome way to protect your jewelry without ruining your decor. Most bathrooms feature a medicine cabinet, meaning a mirror that opens up to reveal a cabinet. If you are not using yours to store pills or anything else, consider turning it into a beautiful jewelry storage option. Most medicine cabinets will feature small shelves, which you can easily remove. You can then add in a colorful or otherwise creative backing, add hooks, and then hang your jewelry as desired, using both the back of the door and the inside of the cabinet. And, if you do not want to make that many changes, don’t worry. You can use the already-present shelves to place small boxes that are filled with your favorite jewelry. You can even label each box with the type of jewelry it contains, such as “rings” or “necklaces,” to make it easy to find your favorite piece. Finally, if you want a low-level, super simple hack to store your jewelry, invest in some plastic storage containers or even the small plastic “cabinets” you often see on desks in offices. You can place little pieces of packing foam inside each drawer or segment and then stick and display your jewelry inside. 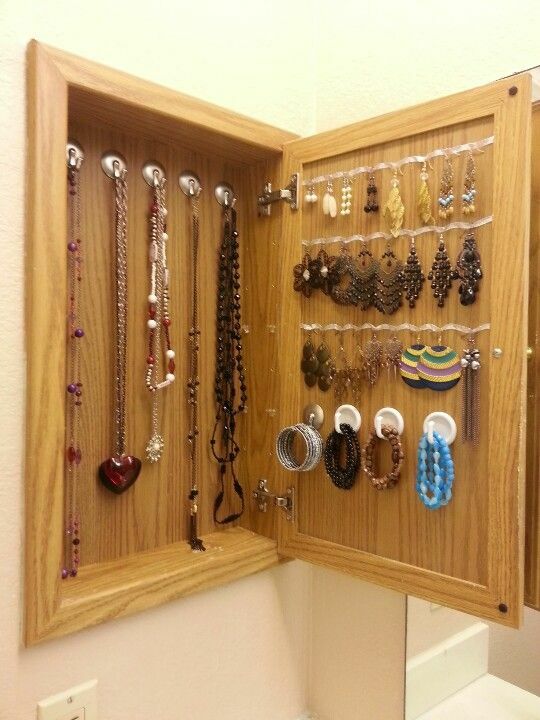 This is a good storage option if you want your jewelry to be in an unexpected place and/or if you are short on space. As you can see, there are all kinds of different ways to make a DIY jewelry organizer. Try one of these options, take an option and alter it to suit your needs, or make up your own storage option entirely. No matter what you do, if you consider the advice presented here, you are sure to end up with a DIY jewelry organizer that you love and that ultimately proves very useful to you.